Fall may be close but there’s sure to be plenty of great Northwest weather still ahead of us. Yes the rain will eventually arrive but let’s get out and enjoy these beautiful days while we have them. This months newsletter runs the gamut with great news on sales and specials and the like. The What’s New Page is stacked with them! We’ll also detail this months events at Falling Water Gardens. We’ll inform you on the plants that are currently looking great at the nursery, feature a recent project and share a delicious recipe. Kick back and give this a read then come see us in Monroe! Did you know??? You may simply know us as Falling Water Gardens, the aquatic nursery and garden center in Monroe with the big fountains and display gardens and such. 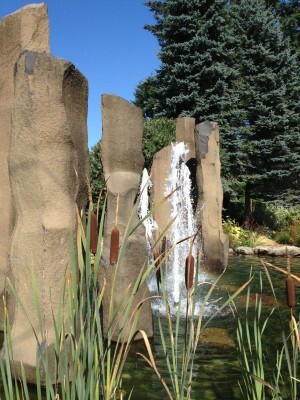 But did you know that the parent company, Falling Water Designs has been designing and installing award winning gardens and water features in the Puget Sound since the year 2000? It’s true. We’ve been featured countless times in the media. We were also featured on HGTV’s show Landscaper’s Challenge not once, but twice. We’ve won awards with the Washington Association of Landscape Professionals, The Northwest Flower and Garden Show and the American Horticulture Society. We must be doing something right. Looking to have some work done in your garden? Contact us for an estimate at (206) 323-2873.